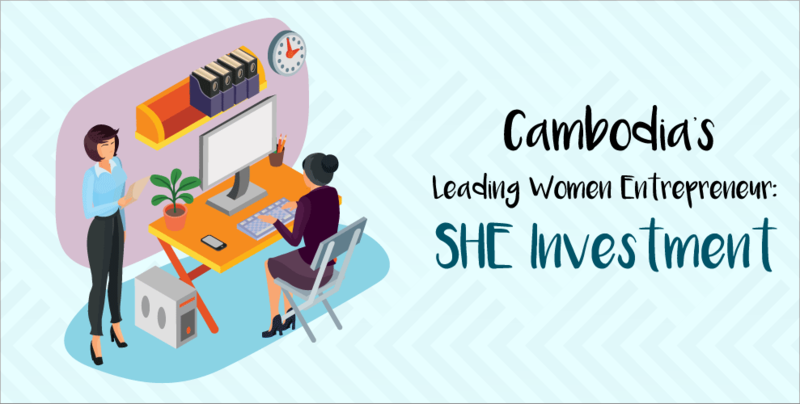 The rapid growth of SHE has significantly aided the women in Cambodia’s business and entrepreneur scene, through their various programmes to educate women on scaling up their businesses and provide several scholarships to support any financial difficulties faced. Geeks in Cambodia sat down with Lida to better understand how SHE empowers women, and some of the victories and challenges she has overcome thus far. What motivated the starting of SHE Investments? Lida Loem (LL): As many as 65% of women in Cambodia are running micro-businesses. They have been around for years and many find it difficult to scale-up their businesses. I felt that empowering these women, by providing them an opportunity to bring their business to greater heights, would not only contribute to the economy and strengthen the community, but also support their families. What does “entrepreneurial spirit” mean to you? LL: For me, entrepreneurial spirit means having good leadership, and good leadership is being accountable. I am accountable for my team’s spirit and their ability to communicate well with one another. With the quick growth of our company, we had to focus on empowering our staff with the vision and mission of SHE Investments. We didn’t want them to work just for the money, but be driven by the purpose of the team and why they first decided to join. What is the greatest victory in your journey thus far? LL: The greatest victory is having a great team that is motivated by the same vision and mission. We also have a great programme that is specially catered to only women and business. I can proudly say there are no business that run programmes like ours. The greatest challenge is our rapid growth – we started with three people in the team and now we have over 15 people. My team and I had to learn to manage not only the company’s resources but also the staff’s needs, making sure everyone feels empowered. We had to build a lot of internal processes and internal policy to satisfy our team and make sure everyone is happy. What was the one personal challenge in your journey? LL: I would say that the main personal challenge would be time management – learning how to balance work and family. I really like what I am doing now and just want to put 100% of my heart and effort to it, but I still have a family to take care of. My children are still young and I need to spend time with them. LL: Draw your dreams, make concrete plans and milestones to reach them. You cannot do the same thing everyday and expect something different. For example, if you are afraid of public speaking, then volunteer to stand in front of a crowd and speak – do something you have never done before. Start small and grow big. Know what you want to do, and start with something realistic that can be achieved in a short time and when you do succeed, that will encourage you. From there you can start setting bigger but reachable goals. Even if you fail, you will not have regrets and it is better than not starting. I’m not saying don’t start big. If you do start big, it might scare you, but if you are confident enough then that’s fine. From everyone at Geeks In Cambodia, we would like to wish SHE Investments the very best as they look to empower more women in Cambodia and give women the support system needed to scale their businesses. Read more about other leading female entrepreneurs in Cambodia here!